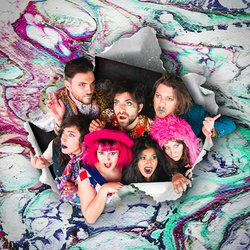 Formed in Melbourne in 2016, eclectic seven piece ensemble Ogopogo combine elements of jazz, disco, funk, experimental pop, and surf rock into a gravity defining mix bag of musical phosphorescence. With lyrics inspired by everything form crustaceans and clowns to cats, morphine and rats taking over your house the band tell relatable and comical stories across a musical bed of horns (alto saxophone, baritone saxophone, trumpet) four part vocals, drums, bass, guitar and keys. Having carved up festival stages everywhere from Rainbow Serpent, White Night, Sydney Road Street Festival and Sofalarama to God Shave the Queen & The Village Festival, Ogopogo features a HUGE array of Melbourne’s finest.